What a cool idea to stencil the tub!!! It's looking amazing and that chandelier is stunning? Geez, how tall are your ceilings? They look huge. Ummm...I need to know where you found your husband, an how can I get mine to pick out ridiculous lighting like yours!? Totally amazing, and that marble wall! As a person who has a very long list of projects to complete, I think we should celebrate every victory! It's looking fabulous - carry on! Wow Tiffany! How do I talk you into letting me move into your house?? That tile is gorgeous and I can't believe you stenciled a tub!! It looks amazing and it must have been quite a feat to accomplish. Great job! Holy heaven...it's fabulous! I'm dying over the marble wall and chandy- just gorgeous! That chandelier is killing me....and you did the marble up to the ceiling. You are sooooo good with the tiny details. I love that about your style! It is looking lovely! 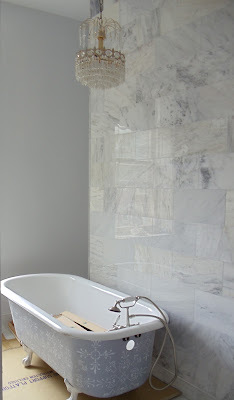 I have to say I just LOVE a chandy above a tub...so cool that your husband has good taste too! I am so in love with the finishes in your bathrooms and kitchens. They look so fabulous! And yay for the hubs picking out an awesome chandy. I simply cannot wait to see how this turns out. You're going to have my dream master bath! Lucky girl.